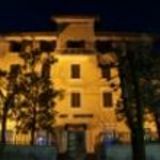 The Museum of Art of Chianciano hosts a series of collections ranging from Neolithic and Asiatic to Contemporary art. There are approximately a thousand works on display. Vistors are able to view paintings and sculptures by artists such as Tom Nash, Francis Turner, Mario Schifano, Damien Hirst, Brian Willsher and Albert Louden, drawings by the likes of Magritte, Guttuso and Munch; historical works from Royal Collections and original etchings by masters such as Durer and Rembrandt. The museum is known for organising annual international events, including the Chianciano International Art Award and the Biennale of Chianciano. Contemporary Artist Sergio Valota was selected for the Chianciano International Art Awards 2012 from over 2000 applicants. The Critic Christopher Rosewood was born in Hastings in 1952 and is a critical writer and curator based in London. As the creator of the book “Figures; from Realism to Abstraction” Rosewood elegantly describes the interiors of the Victoria and Albert Museum, the permanent collections and the artworks of great contemporary artists such as Tom Nash and Jin Cheng Liu. The exhibition was presented at the Victoria and Albert Museum, which was well received by the public and critics; and this important publication is a testament to the difficult task of selecting the artists and hosting the exhibition. Rosewood also selected important works by Frances Turner presented at Museo del Chopo in Mexico. These works were published by the Museum in an important publication during this solo show. A noteworthy quote by Rosewood is “Always with the artist.” He has a huge admiration for artists who he believes are people that often work in solitude, who create and who send their message to the world, a message that is often related to their feelings, whether in a still life or an artwork depicting social issues or an abstract that allows the viewer to have a totally personal interpretation of the artwork. Rosewood is not only an art critic of contemporary art but also well known for his research on Renaissance artists. He has contributed to important writings on Palma the Younger, the artist that finished Tiziano’s “Pietà” after his death, as well as his studies on Durer, Rembrandt and Rubens. 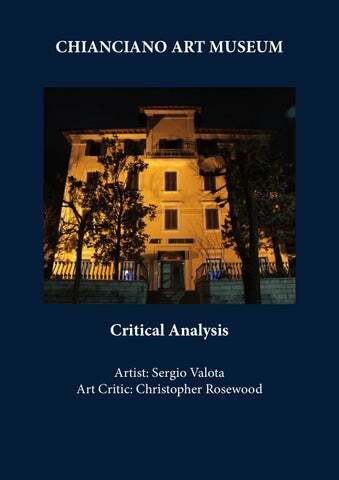 The critic was a great friend of Bill Hopkins of the International Association of Art critics, with whom Rosewood participated in research on the various aesthetic expressions linked to art and the philosophy of form. The Artist Sergio Valota was born in Seriate, in the province of Bergamo, on 28th March, 1957. Before devoting himself to painting, he worked in graphic design, an activity that he has always carried out with great skill, obtaining excellent results. A meeting with Mario Donizetti changed his life and his conception of art combined with a strong study of traditions, not only from the aesthetic point of view but also with scientific and rigorous research of ancient techniques and materials. Donizetti became his mentor, and Valota, a devoted and capable student, learned his skill and discovered his personal style. In 1980 Valota made ​​his debut in Sarnico with an exhibition at the Gallery of Sarnico, then participated in the important International Art Exhibition at EUR in Rome, the New York Exhibition at the Coliseum, the Prado Museum of Madrid, an exhibition in Basel, and in 2012 at Palazzo Fatta, Palermo. In the same year, Valota was selected from among 2,500 candidates for the exhibition organised by the Chianciano Art Museum, Tuscany, and on this occasion he was awarded the prestigious 3rd Prize by the Anglo-Italian Academy of Art. At the London Art Biennale in 2013 he was elected a member of the Academy itself. His work was then displayed in an exhibition at the Galerie Seine, Paris. The artist later took part in an exhibition in Monaco at the Grand Palais. Sergio Valota recently won the Golden Lion award of the Doges of Venice during the Biennale in Venice in 2013 and took part in a group exhibition at the Gagliardi Gallery in London, at the Berlin Exhibition, and at Palazzo Frizzi in Forlí, Emilia Romagna. Valota is now at the peak of his career thanks to this international recognition, and his extraordinary masterpieces can be seen in many collections all over the world.